Rhodes finds that his blood sugar is lower and more manageable on days he starts his morning with exercise. Give it a try! Even 15 minutes of walking in the morning or walking over your lunch break will give your system a boost. Set your alarm for just 35 minutes earlier than you would normally get up. 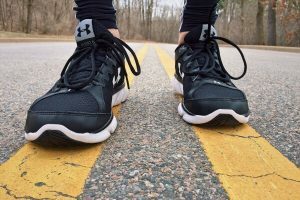 Give yourself 5 minutes to get dressed, 5 minutes for light stretching, 20 minutes to walk or jog, and 5 minutes to stretch and catch your breath. Commit to just 3-4 days a week. Don’t forget to drink a lot of water and carry a sugar source with you if you have a risk of lows! Try a pack of glucose tabs in your pocket. If you have worries about joining or using a gym, check out Alana’s post on Joining A Gym. Do you exercise in the mornings? How does it affect the management of your diabetes?